The role of Naval Chaplains is threefold. Not only do they care for Defence members' religious, spiritual and pastoral needs in a non-denominational fashion (ie. covering all religious beliefs), they also provide a support and counselling service, in addition to teaching Personal Development (PD) lessons. The Chaplain's PD lessons aim to instil a sense of morals and ethics into every officer. They teach you the importance of behaving in a moral and ethical manner and to encourage like behaviour in your peers and subordinates. The Chaplain's role within the Navy is unique, in that he or she stands outside the College's immediate chain of command. This means that if you have a problem that you don't feel comfortable discussing with your superiors, the Chaplain is available to help you resolve it. 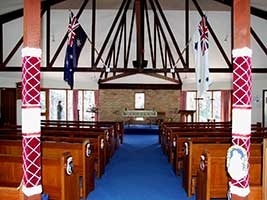 The chapel here at HMAS Creswell is known as the "Holy Trinity on the Bay". As well as providing Sunday Services, the chapel is available for marriages, baptisms and other pastoral services to Defence members and their immediate families.